Similarly, the role of women in the pulps needs to be re-examined. There were of course female writers for the pulps– more for the “women’s pulps” than the more putatively masculine pulps, but even in pulps like Adventure and Astounding there was the occasional female author. Nor were women just authors; in January 1928 Daisy Bacon (1899-1986) became editor of Love Story Magazine, and within a year had boosted its circulation to the top of the market. But something that has received even less attention is the position of women in the pulp-buying audience. Most people would assume that women were not in the forefront of the pulp publishers' minds when they were conceiving of and publishing pulps. Pulp scholarship (what there is of it) consigns the female demographic to the romance genre, and assumes that women were buying the slicks rather than the pulps. But a look at the numbers in 1928 certainly makes me wonder if that assumption springs from sexism and an underrating of the publishers. It’s a safe assumption that the great majority of the buyers of Romance pulps were women. Regarding the dominant genre, Western, only two of the 18 Western pulps published this year were Western Romances. But there's always been a certain number of women who enjoyed Westerns, and if Ranch Romances was largely responsible for the rise of the Western, doesn’t it follow that Ranch Romances persuaded both men and women to start buying Western pulps? It seems likely that the Western audience did not consist only of men who, on seeing Western pulps on the newsstand, added Westerns to their lists of pulps to buy. Women would likely have been persuaded as well. Certainly in the late 1920s there were an increasing number of pulps, like Live Girl Stories (1929-1930, 3 issues) which were aimed at the female market, and were an attempt to give women the equivalent of the male adventure pulps, only with female protagonists. And an increasing number of stories in genres like Western and Detective had women in active roles, although the real surge in heroines as lead characters would come in the mid-1930s. The pulps had a surprising number of female protagonists--despite their (deserved) reputation for racism and sexism, the pulps also had a lot of female and non-white heroes and heroines, far more than appeared in the slicks. So perhaps the truth is that pulp publishers were less in thrall to sexism than we now assume. It would not be at all odd or unusual for greed to trump sexism in their thought processes. So the pulp market needs to be conceived of as more mixed than is traditionally thought. Certainly in the late 1920s teenage women had a historically unusual amount of money to spend on luxury items (Jon Savage's Teenage: The Prehistory of Youth Culture is quite good on this) like magazines, and undoubtedly a certain number of them were geek girls, the kind who would like and buy Western and Detective and, yes, Science Fiction pulps, even if they were forced to be more covert than they are today. So any thoughts about the pulp market needs to take this into account. Nevins, Jess. The Pulps: A Yearly Guide (p. 70-72). . Kindle Edition. The pulps had a surprising number of female protagonists--despite their (deserved) reputation for racism and sexism, the pulps also had a lot of female and non-white heroes and heroines, far more than appeared in the slicks. especially in these days where under-representation of minorities and women is a cudgel by which critics castigate past works. When the speciality pulps did begin appearing, they were neither mainstream nor particularly successful. The publisher Frank A. Munsey, whose Argosy had begun the pulp era, brought out his third pulp, The Railroad Man’s Magazine (cover date October, 1906), followed by Woman a month later. Munsey was a successful businessman at this point– his magazine Munsey’s Magazine was selling very well, and he owned four newspapers– so the personal risk involved in bringing out two specialty pulps was comparatively small. Additionally, the choice of subject matter– the railroads, and women– was not random. There had been two railway-centered dime novels: New York Ten Cent Library (1896-1897), which lasted for 32 issues and Comrades (1900-1901), which lasted for 72 issues. While both only lasted for two years, Comrades’ run of issues was longer than the mean for dime novels, and Munsey correctly perceived a market for railway-centric fiction. Similarly, magazines like Women and The Woman at Home in the UK and the Ladies’ Home Journal and Woman’s Home Companion in the U.S. were demonstrating that women were a powerful market for periodical fiction. Railroad Man’s Magazine proved to be a minor success, and lasted for 73 years and 692 issues before transforming into the non-fiction Railfan and Railroad, which continues to be published today. In its early years Railroad Man’s Magazine published a range of genres, from romance to hard-boiled detective fiction to eccentric inventor science fiction, although always with a orientation to railroads. Never a best seller, it served its audience faithfully and at times published mid-level talents, like Johnston McCulley (creator of Zorro) and Louis Vance (creator of several characters). There was no other railway pulp--the long-rumored Railroad Detective Stories in all probability never existed--so we can't say that there was a railroad pulp genre. 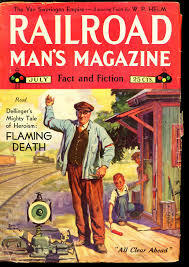 But Railroad Man's Magazine certainly had longevity, and its stories varied hugely in content, and some were surprisingly imaginative and good. Nevins, Jess. The Pulps: A Yearly Guide (pp. 19-20). . Kindle Edition. Not only was Railroad Man Magazine the first specialty pulp devoted to a single subject, it survived twenty years beyond the death of the pulps. It's success would pave the way for the wide variety of specialty pulps during the heyday of the format, including Weird Tales, Amazing, and Astounding. PulpFest 2015 - Weird Editing at "The Unique Magazine"
A look at the oddities and foibles of Weird Tales editor Farnsworth Wright--and the longsuffering authors who submitted to him. We know who people are by what they do. This does not mean that every scene has to involve a knife fight on the top of a speeding train. Ordinary every day actions can also inform—Raymond Chandler could describe a couple’s relationship by showing us the man lighting the woman’s cigarette. We don’t want the writer to tells us that a scientist is an unconventional genius, we want to see him tearing a rival’s paper to shreds and throwing the pieces out the window when asked to critique it. But how can an action reveal or undermine a character? In the video below, HyperDrive explains how the misuse of a particular move in a fight, the "protagonist throw" by the neck, end up harming villains. For instance, if a villain has spent the entire story killing everyone he gets his hands on, would he really just pick up the hero by the neck and toss him away? In most cases, where this is used in a fight where the villain is demonstrating killing intent, the answer is no. But if the villain's motive is intimidation...? This video serves as a reminder that a writer must be aware of what a character's actions say, and not just the dialogue. On the amusing side, there are two gadgets that claim to tell you what famous writer your style most closely matches. According to I Write Like, my trunk fiction style most closely resembles Agatha Christie's, although I have yet to see a #PulpRev writer who hasn't scored the same. Mark Allen Thornton, however, has used a wider array of authors from Project Gutenberg books to create his own version. His widget is more dependent of "stop words"/"sticky words" and punctuation marks in an attempt to peg certain writers on their lexical density. It is amusing, and perhaps these toys will connect more writers to the canon of the past. Those looking for help with editing may find the next one more useful. For some time now, the ideas of the Campbelline Age and the Golden Age of Science Fiction have been conflated, occupying a period of time from 1937 to 1971, ending with Campbell's death and the presumed rise of New Wave. * Yet during the Great Campbell War over at Castalia House, it became clear that the time period remembered as the height of the Golden Age was the 1950s and 1960s, not the height of the Campbelline Revolution in the 1940s. (This falls in line with Robert Silverberg's idea of when the Golden Age occurred.) Campbell did remain influential during this time, burdening science fiction with psionics and other pseudoscientific concepts, but he was now one voice among many, and no longer the lead dog. So where and why did Campbell's influence fade? Let's start with a rexamination of Campbelline SF, a body of literature thought to be dominated by Men with Screwdrivers and the Happy Engineer. The Happy Engineer is one of the great uninvestigated myths of contemporary science fiction. (Another is that Astounding/ Analog was/ is devoted to stories whose background is "hard science" requiring "heavy tech," but that is next Sunday's text.) The truth, as any fresh confrontation of the material would certainly make clear, is that the forties ASF is filled with darkness, that the majority of its most successful and reprinted stories dealt with the bleakest implications of technology and that "modern" science fiction (defined by Budrys as that which originated with Campbell's editorship of Astounding given him in October 1937) rather than being a problem-solving literature was a literature of despair. Malzberg, Barry N.. Breakfast in the Ruins (Kindle Locations 1216-1221). Baen Books. Kindle Edition. [At] the world science fiction convention of 1947, at which [John Campbell] was guest of honor, he begged for the fans' indulgence at the profusion of despair, claiming that he could only publish what the writers were delivering . . . but he was sending out pleas to cease and desist. Malzberg, Barry N.. Breakfast in the Ruins (Kindle Locations 1243-1246). Baen Books. Kindle Edition. And, indeed, Campbell did exercise his editorial power. Unfortunately for him, H. L. Gold and Anthony Boucher soon started Galaxy Science Fiction and The Magazine of Fantasy & Science Fiction, both with a more permissible editorial policy in line with the fashion of the writers of the time, including the indulgence of despair. So many writers jumped the Campbelline ship for Gold and Boucher's in 1950. Campbell would never again hold the same prestige and power in science fiction. But even Gold and Boucher would have enough. By the time "The Cold Equations" killed off the Campbelline Revolution in 1954, science fiction sales had plateaued and most of the Campbelline authors, to include Asimov, the Kuttners, and Heinlein, had either abandoned science fiction entirely or sought out more lucrative markets. Science fiction magazines became increasingly dominated by an ever-shrinking authorship, and despair clung to the stories well into the 1980s, when Bruce Sterling would complain about the same types of stories as Gold. And it is in this Age of Despair where the otaku-ization of science fiction and the Futurian revolt occurred. *If one reads sources from the 1970s and early 1980s, it is clear that New Wave had peaked and was pretty much over before Campbell's death. However, this is right about when mainstream science fiction attempted to be edgier than the New Wave. To return to the analogy of scientific truth, if one happened to believe a particular theory–say that all planets in the solar system rotate on their axis in the same direction–and then encounters evidence that contradicts this theory–the axial rotation of Venus and Uranus–then suppressing the evidence in order to hold onto the theory is wrong. Either the evidence is bad, in which case further study will contradict it, or the theory is wrong, and to continue to cling to it in the face of evidence against it is an act of willful ignorance. However, the above analogy is also predicated on the assumption that you understand the science–the math involved, how to apply the theory, how to determine the proper frame of reference, knowing in what way the science is applicable as a model for the real world. In the same way, if a work of art is beautiful, if it moves you, then it is expressing a truth and if that contradicts an opinion that you hold, that may be evidence that your opinion is wrong. It may also be evidence that your esthetic sensibilities are unequal to the task of understanding the work in question. The way to avoid being taken in by junk science is to develop an understanding of real science. You don’t have to be an expert in a particular field to understand how to tell when a sample size is statistically significant or when a conclusion does not follow logically from a premise. In the same way the defense against propaganda is not suppression of bad art, but an understanding of esthetics sufficient to recognize it as bad art. A good grasp of mathematics will inoculate one against pseudoscientific scams, and a good grasp of narrative and story will inoculate one against propaganda masquerading as fiction. A well-trained esthetic sense will also allow one to understand the applicability of the work to the real world. Just as a trained scientific intellect will understand what a scientific theory does and does not imply regarding reality, a trained esthetic sense will understand what art does and does not imply about reality, and to see the significant parallels while discarding the spurious ones. The message of The Lord Of The Rings, for example, is not that short people are better than tall people. I am loathe to add more, except that we are currently seeing this lack of a well-trained esthetic sense play out in the arts today. Stage Magic, Writing, and Ricky Jay. What does Ricky Jay have to do with pulp? He is perhaps the greatest disciple of Dai Vernon, one of the best card sharps of the century, and member of the Witch Doctor's Club, where Issac Asimov and Walter Gibson were members. Enjoy this practical demonstration in misdirection and pacing. Listen to his stories and watch how he pulls your attention away from when he actually makes his moves. All the elements are right in front of your eyes, but not always when you're paying attention. Yesterday, I was privileged to join Brian Niemeier and Alfred from the Injustice Gamer on the Geek Gab On The Books livestream to talk about pulps, detective stories, and crime. When the conversation turned to some of the more unique pulps, a connection was made between pulp writers and their hobby of stage magic, which both Brian and Jeffro Johnson of Castalia House found significant. “FOR some unexplained reason, magic fascinated the pulp writers of the 1930s and ’40s. “The king of them all was Walter B. Gibson, who created The Shadow out of a mesmerizing radio voice and his close association with Blackstone, Thurston, Houdini, Dunninger and other notable magicians. Gibson was as famous for his books on stage magic as he was for his prolific pulp output. He knew all the tricks, from Hypnotism to escape stunts, and employed them freely in spinning his Shadow stories. Fleming-Roberts, G.T.. Diamondstone: Magician-Sleuth . Altus Press. Kindle Edition. Here is a short list of stage magic-inspired pulpsters: Lester Dent, Walter Gibson, Norvell Page, Paul Ernst, “Curtis Steele”, Ken Crossen, Clayton Rawson, G. T. Fleming-Roberts, H. P. Lovecraft. Audiobook Wednesday: A. J. Raffles in "The Ides of March"
Before Batman and The Shadow, before Arsene Lupin the First an the Third, there was Arthur J. Raffles, amateur safe-cracker. I think I may claim that his famous character Raffles was a kind of inversion of Sherlock Holmes, Bunny playing Watson. He admits as much in his kindly dedication. I think there are few finer examples of short-story writing in our language than these, though I confess I think they are rather dangerous in their suggestion. I told him so before he put pen to paper, and the result has, I fear, borne me out. You must not make the criminal a hero. Because writing is removed in time and space from the audience, the sense of the writer as a performer is lost. An actor or a musician must tailor their performance based on the audience’s reactions–or to get the precise reaction from the audience that they want. A magician must manipulate an audience’s attention so his tricks appear “out of nowhere.” Yet writing and the industry are more concerned with Platonic ideals of what art should be instead of going out and busking for a living and getting that all important practical experience in front of an audience. Today's writing is often characterized by a search for the Platonic ideal of story, with the beats in the right place and the proper mix of characters and attitudes. It worries more about matters of craft than matters of audience reaction. It is inward focused. "If you don't spend time watching real people, you can't do this, because you've never seen it. Some people spend their lives interested only in themselves. Almost all Japanese animation is produced with hardly any basis taken from observing real people ... It's produced by humans who can't stand looking at other humans. And that's why the industry is full of otaku!" "Did you ever come up against a book of writing technique that came right out and said: “Look, Joe, for Hell’s sake, forget all this guff about plot structure and be downright, just plain, ordinary entertaining.”? Well, that’s the main rule of fiction writing, for my money. That is the idea." "The trouble with most of the rules of writing technique is that these very rules can be—and sometimes should be--broken, in order to make a story salable. To be salable, a story must first be readable. To be readable, it must be entertaining. It’s really quite simple. "But how in hell can your story be entertaining, if every moment that you spent creating it, you were constantly sweating and straining to make it technically perfect inasmuch as “the man in the book” said it should be?" Turner, Robert. Pulp Fiction (Kindle Locations 264-268). Originally published by Quality House, 1948. Kindle Edition. Anthony's recent Castle of Cagliostro review at Castalia House sparked an idea. (By the way, I need to go back and explain why it is A Big Deal that Lupin III squared off with the Cagliostro family. His ancestor Arsene Lupin would be proud...) With the 50th anniversary of Lupin III coming up--and "Blue Jacket" Lupin hitting American TV--there's time to do a bit of an in-depth look at Japan's gentleman thief. So, working backwards from the present day to the beginning of the MAD Magazine-inspired gentleman thief's adventure. I might substitute Castle of Cagliostro for the second TV series. Anthony's review was from the perspective of a Miyazaki fan and not really Lupin-centric. 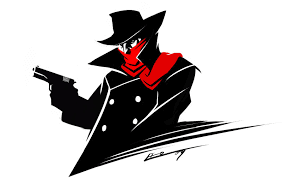 While I have an eye for putting a fair bit of this on the Castalia House blog (my regular posting day falls right on Lupin III's 50th anniversary), the thief will appear here.as well. I've got far more Lupin III than appears on this list, and I also want to take a closer look at his grandpa, the French gentleman burglar Arsene Lupin. Without him, there would no Shadow, Batman, or Lupin II. Robert Turner shares some well-earned advice to pulp writers in his 1948 booklet, Pulp Fiction. I hope you know what emotions are, because they play a prominent part in this not so gentle art of fiction writing. You, as a writer, are going to play on emotions, with words, as a pianist tickles the ivory keys with his fingers. At least, you are if you intend to succeed as a fiction writer. We all have emotions. Prod any reader’s emotional reflexes and, Mr. and Mrs. Writer, you are going to entertain him. I am not a psychologist, so perhaps my definitions of these terms will not be technically correct. But they will serve the purpose to show you what I am getting at, I think. To me, the condition of being entertained is a comparative state. It is being aware, the opposite of being bored. If you needle a reader’s emotions, he cannot be bored. There are many ways to do this. The more of them that you learn, the more powerful and successful a writer you will become. That is why, forever after you have sold your first story, you will constantly study people and other writer’s work, to learn more and more of the tricks of getting at people’s emotions. Examples are sometimes good for clarification. Okay. Let’s say that you love dogs. You are walking along the street and you see some guy kicking the hell out of some skinny, half starved little pooch. Or some sadistic guttersnipe is tying tin cans onto a puppy’s tail. What do you feel? It can be anger, or sympathy, or both. Those are emotions. All right, there are two nice little emotions all lined up and dusted off for you. Use them in a story. Substitute the villain or one of his henchmen for the guy doing the kicking in the example used. Substitute your hero--or heroine--for the pooch. I’ve started many a story that’s sold, with the hero getting hell beat out of him--or just coming out of unconsciousness and pulling himself to his feet, after taking a shellacking. The reader feels sorry for the character, he feels sympathy toward him. You have aroused an emotion; therefore, you are entertaining the reader. To do this properly, of course, you have to build a scene that comes alive in the reader’s mind. That hinges on the subject of realism and we will deal with that in due time. In the street scene example, something is really happening and you damned well know that, because you can hear the dog squealing or whining and you can hear the guy cussing and the sound of his boot connecting with the animal’s ribs. In the story scene, you’ve got to kid the reader into thinking it is actually happening. We will cover that, later. Now, for Job’s sake, please don’t start every story from here on in, with some poor guy getting the bejabbers beat out of him. That is only one way to arouse one emotion in a reader. There are hundreds--perhaps thousands--of other ways. For the answer, and more of these invisible rules of grammar, check out Mark Forsyth's article at the BBC. Lately, I've grown to enjoy listening to the podcasts from the old veteran wrestlers like Ric Flair and Steve Austin. Not only does it provide a look at storytelling from another medium, it gives me a view on how the pros look at their craft. The old guys are constantly recommending matches for fans and up-and-coming wrestlers to watch, not just from an enjoyment standpoint, but with an eye on specific storytelling technique and mechanics displayed in the match. This got me to thinking. It is common advice for a writer to read widely in their genres. However, I don't often see recommendations driven by technique. "Look at this book by this author and watch how he does this." Writing instruction on the web tends to be heavy on technique and formula, but sparse on execution and example. So, if you're trying to help a fellow writer, what books would you recommend as examples of technique? Neil Gaiman's The Sandman comics for framing stories and how to use story-in-a-story. C. L. Moore, "Shambleau" for how to create characters using contrast.